Ever since kosher bacon has become a thing, I have been obsessed. Whenever we’re at a restaurant with some version of kosher bacon on the menu, you can be sure I’m going to order it. I love lamb bacon, beef bacon, veal bacon, you name it. If it’s crispy and salty, I’m ordering it! Now that I live in Israel, I have tried to find it at all the local stores, but have had no success. One butcher swore to me that this goose bacon was the real deal, but I did not enjoy it. Maybe if I would venture to Jerusalem where there are more Americans I would find what I’m looking for, but for now I pretty much stay in the Modi’in area for grocery shopping. On our recent trips back to the States, I of course brought back frozen bacon. I brought a BUNCH from Jack’s Gourmet and some beef fry from local butchers. 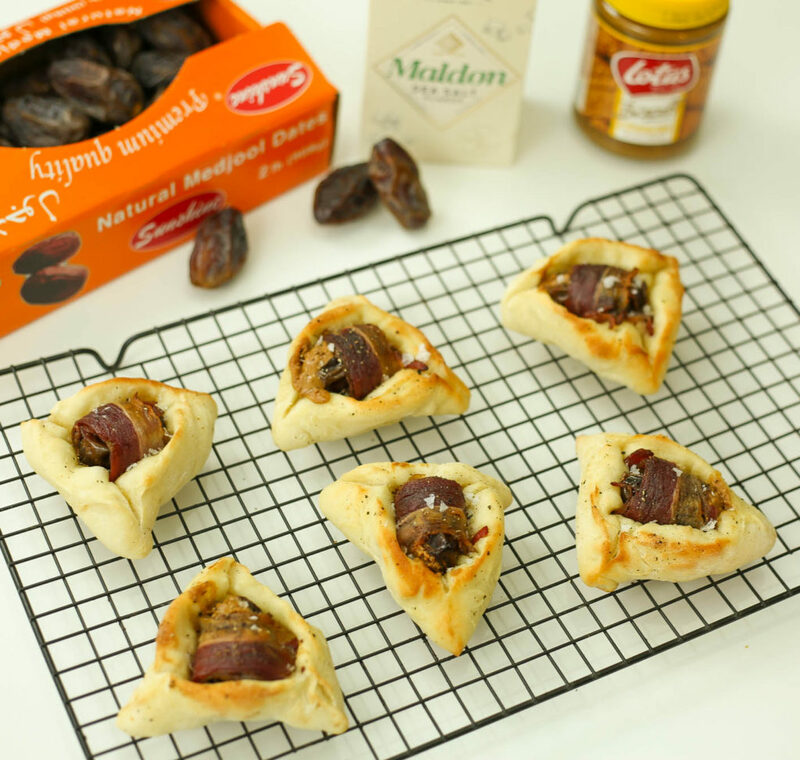 This past Rosh Hashana I was planning on making creative simanim (symbolic food) including a bacon-wrapped date. Then I got what people here call the “Choleh Chadash” syndrome (meaning newly sick, a play on the words Oleh Chadash which means new immigrant). I was so sick, I missed out on all of Rosh Hashana and had to cancel all my meal plans. So the bacon-wrapped date ended up forgotten. On our last trip to New York, I finally got a chance to dine in the famous Bison & Bourbon. It was amazing! On the appetizer menu, I noticed bacon-wrapped dates and I got so excited since I had yet to actually try this dish that I have been dreaming of. And it did not disappoint! The salty mixed with the sweet was so full of flavor that I knew I needed to try making these myself. We got back from the states around 2 weeks ago and I’ve been in full Purim mode. I was thinking of creative ideas to try, and I of course added the bacon-wrapped dates to my list, though I was stuck on what the base should be. I first thought of phyllo dough, but decided against it because I thought it wouldn’t hold its shape well. I also wasn’t so excited about how greasy it would end up being, so I put that on the back burner (figuratively) for now. 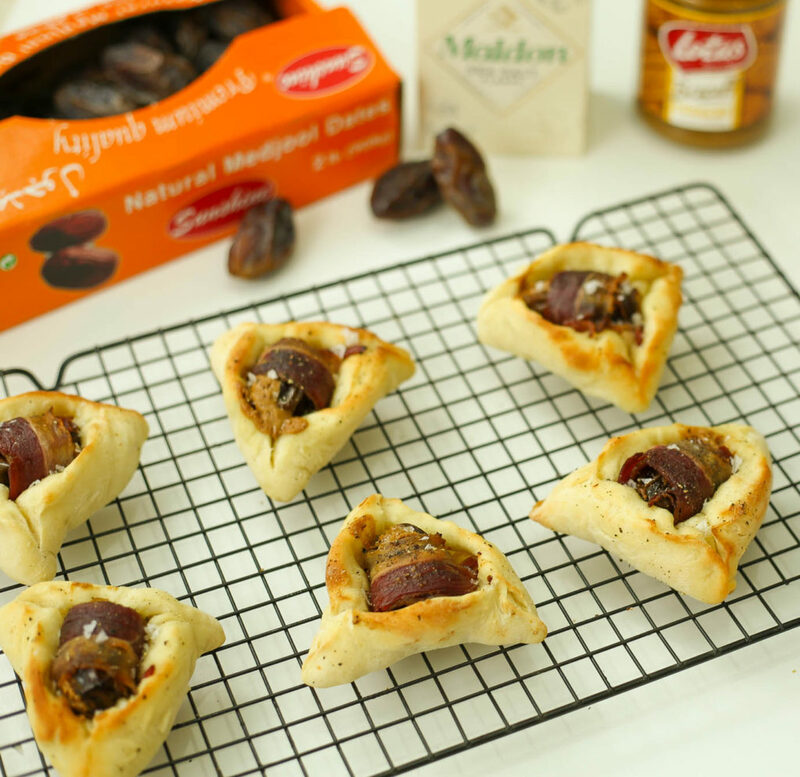 A couple days ago I revisited this idea, and had a new thought – why not try my pizza dough?! It’s known for its thin-crust, so it won’t puff up. Plus, it’s a great canvas to soak up the amazing flavors that would drip out from the bacon and dates! The last part that I was trying to think of was the stuffing. 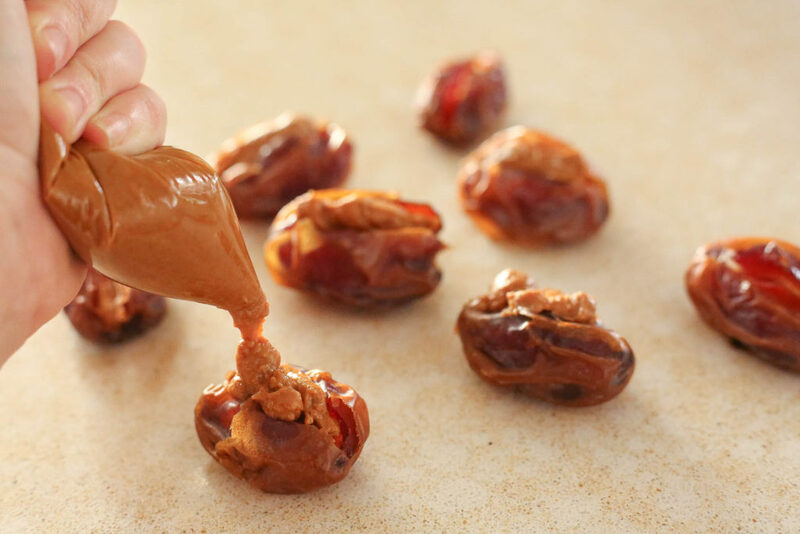 See, you don’t just wrap the dates in bacon, you also stuff the dates first! I did some research and it seemed very popular to stuff them with goat cheese or nuts. Both sounded amazing – especially the goat cheese – but of course that would not work for me —#KosherProblems. I settled on Biscoff Crunch Cookie Butter cookie for its creaminess and crunch. But also because I’ll jump at any excuse to incorporate cookie butter into my food. So I put together my newfound combination, tested it out and could not be happier! I added some freshly ground black pepper to add a little heat and complexity, and topped it all off with Maldon salt to cut through all the sweetness you get from the dates and cookie butter. These were so easy to make too, which makes them even more of a win in my book. If you have ever made my pizza dough, you already know how easy that is. 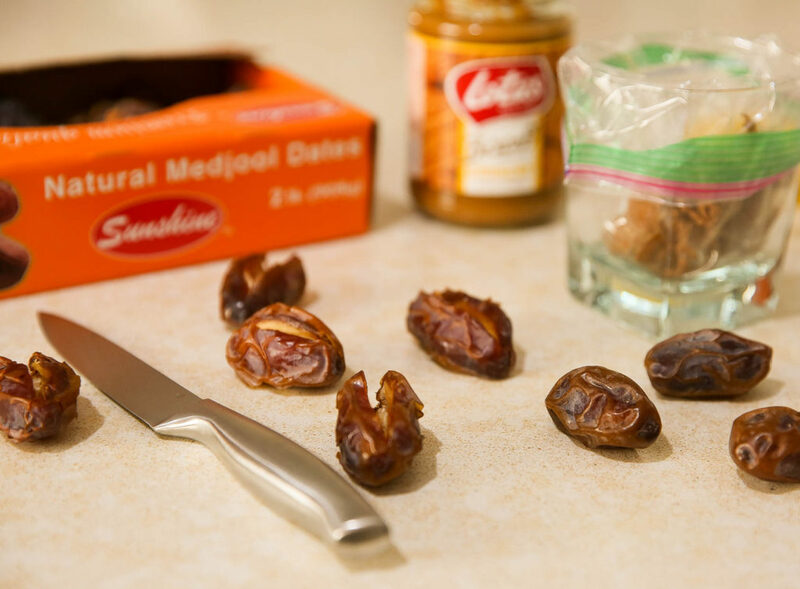 After that, all that’s left is slicing the dates, filling them with cookie butter, wrapping them in bacon, and placing them in the dough and closing up. Then bake for 8-10 minutes and you’ll have yourself the most delicious, salty, sweet, crispy, doughy hamantaschen you’ll ever taste! Place a ziplock bag into a measuring cup or glass cup, pulling the edges over the sides. Scoop the cookie butter into the bag. zip up the bag and snip of a corner. Pipe the cookie butter into the center of the date, where the pit used to be. If you like crunch and nuts, first add in some nuts and then fill the rest of the space with cookie butter. Prepare the pizza dough now, see below. You do not want to prepare it before you are ready to assemble and bake because we do not want to let the pizza dough rise at all. 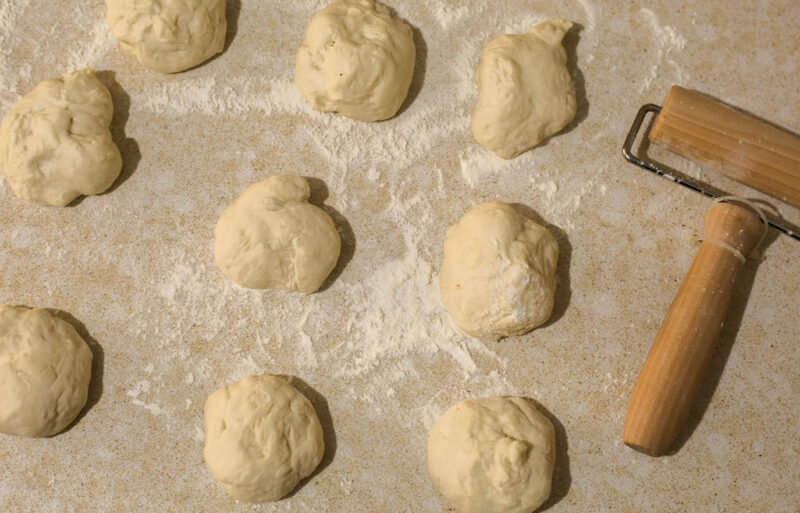 Once the dough is prepared, divide into 12 balls. Flatten each ball with your hand and the help of a small roller until you have a small disk, around 1/2 inch thick. 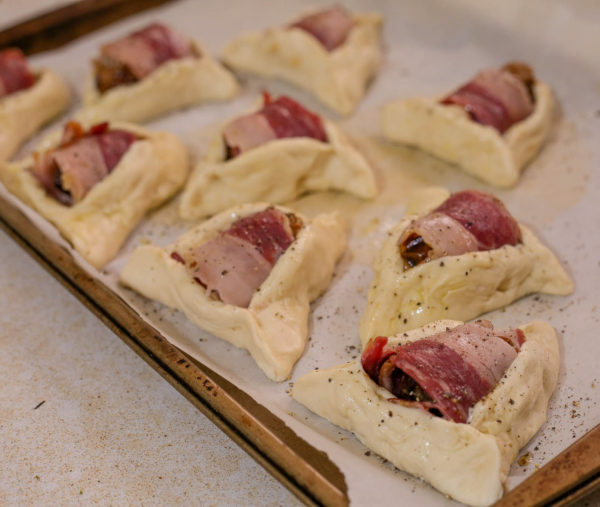 Wrap a peice of bacon around each stuffed date, place in the middle of each pizza dough circle and close up like a hamantaschen around the date. Place the hamantaschen on a parchment lined baking sheet. 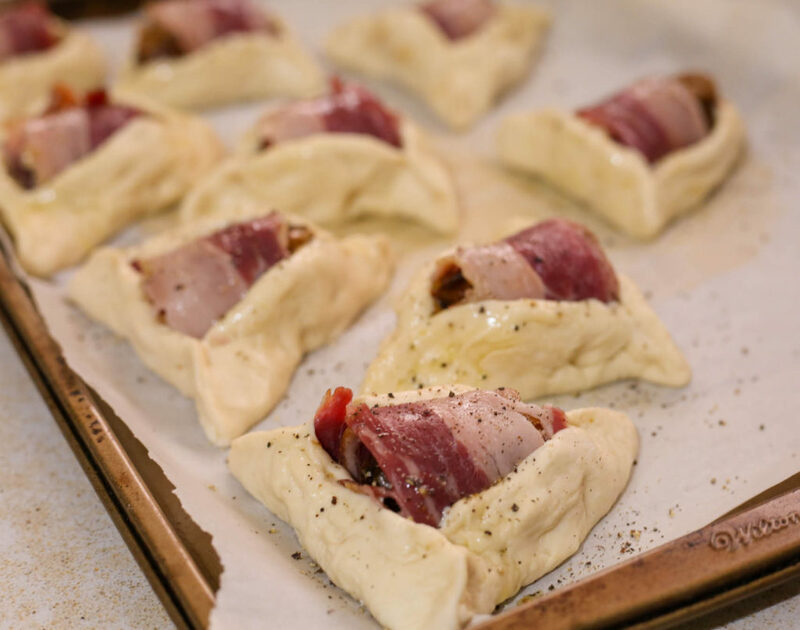 Spray the hamantaschen with a Misto filled with olive oil and sprinkle freshly ground black pepper on top. Bake for 7-10 minutes until golden. Top the fresh from the oven hamantaschen with maldon salt. The cookie butter and dates gets very hot, so be careful! In a bowl of a stand mixer, mix together the water, yeast, and honey. Let that sit for 10 minutes. After 10 minutes, mix the flour and salt into the yeast mixture. 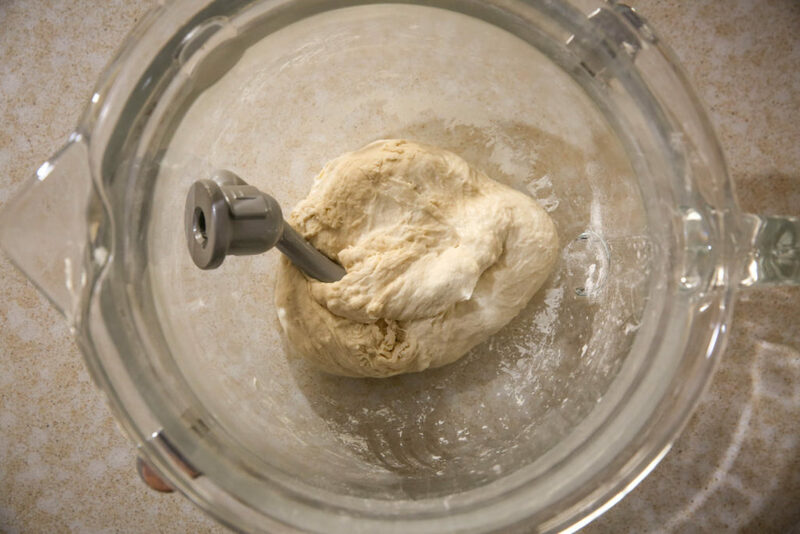 Mix until the dough comes together in a ball around the dough hook, around 7-10 minutes with a KitchenAide. If the dough is still sticky, use 1 tbsp flour as needed until it becomes silky, you shouldn't need more then 1-2. Previous post Welome to JoodietheFoodie.com! What is Biscoff cookie butter and how do I make it? It’s a kosher cookie butter made by Lotus, it basically tastes like a butter made from cookies, it is delicious. It is kosher here in Israel and recently they started importing the kosher ones to America too! A lot of kosher stores in the States now carry it!